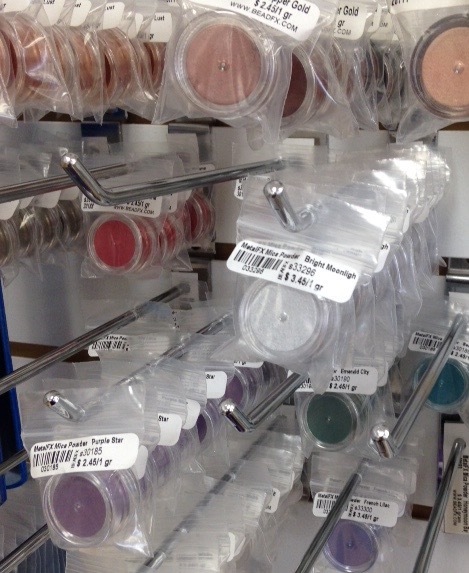 Sure BeadFX has tons and tons of pre-made beads, but haven’t you ever thought about making your own? I bet that you’ve lusted over artist-made beads, but aren’t you just a little curious about how they’re made? DIY beads come in many different flavours. I’ve personally experimented with paper, Tyvek (think Fedex envelopes), fabric, threads, epoxy clay (Apoxie Sculpt & Crystal Clay), polymer clay, wool felt, acrylic felt and various types of wire (some successful and some not). My beads have been varnished, glued, baked, wrapped, painted, gilded, mica powdered, heat distressed, coated with resin, soaped up, watered down, and thrown on the ground! The crowning glory of my bead obsession was when I donned full winter gear, pulled on my respirator, and then heat distressed (with a heat gun) some polyester organza beads, on my balcony in -17 C weather. I believe that it was also snowing lightly! Giggle! Am I crazy? Well yeah, my neighbours probably thought so, but I did like the results! I currently teach a paper beads class (shameless self promotion, and my latest is running this Saturday), and have often thought that a collection of other DIY beads would make an interesting day of play. Pssst! Guess who just received a few silicone bead molds (for resin) in the mail? Yeah, more beads for moi! 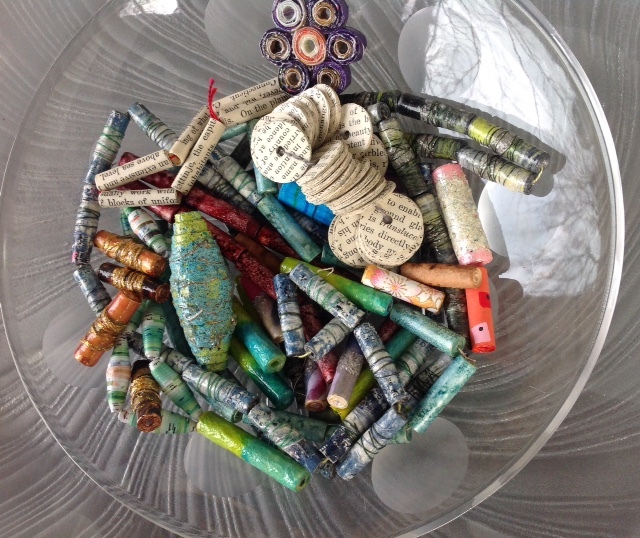 Yummy Tyvek Beads courtesy of Carolyn Saxby of the UK, via Pinterest! Have you ever drooled over those fabulous handmade glass beads? Did you know that you could also make DIY beads out of glass and various metal clays? Of course it takes some training, but wouldn’t it be wonderful to know how to make them yourself? Are you aware that BeadFX has both a Lampwork (glass beads) and Metal Studio, they offer workshops, and you can also rent studio space? No need to kit yourself up with all the expensive equipment, if you just want to give it a wee try! One of these days, I will dip my toes into these new (to me) mediums! But I already do so much, and what if I really, really like them? My sewing machine is already suffering abandonment issues, so what will happen to my other arts & crafts supplies? Beads courtesy of Dragon Jools & Carol Ann Savage! Lampwork beads from a selection of artists (including the two mentioned) are available at the store. Use Gilders Paste, mica powders and Iced Enamels (all available in the store), to embellish your DIY beads, then make them into a necklace or bracelet. Add more glass, metal, stones, pearls or sparkly crystals, for a knockout fashion statement! Bead or braid a rope, buy some chain, wrap a little wire, or even string your new beads on colourful spagetti leather. The options are endless!! Beading doesn’t always need to be a serious affair. Play around with alternate techniques to make luscious DIY beads, but don’t be surprised if you end up with a brand new addiction! Err…..perhaps I should say passion! Sixteen years of making a difference!